So, my girlfriend sent a link to my blog out to a host of her friends who she thought might be interested in reading my badly proof-read musings on pubs and beers. It turns out a few of them were quite into it. None more so, though, than a chap called Gareth, organiser in chief of the Bowland Stags, a group of chaps brought together by Gareth’s stag do last year (they toured breweries, it sounds like a hoot) in their quest for quality booze. “It’s not just a piss up,” says Gareth, “with emphasis on the word ‘just'”. Their next trip, it turned out, would be starting at Wetherspoons in Leeds station for a very swift pint, before hitting the tracks and calling in at a number of quality pubs in or around stations on the Trans-pennine line (or a trek away, if you call into Slaithwaite – pronouced “slough-it”, unless you’re very posh ). It sounded to me like a great way to spend a Saturday, and a sure fire way to write off my Sunday. I was right on both counts, and an errors or typos here can be explained away by this strange pain in my head and slightly queasy feeling in my stomach. It just must have been that beef sarnie or pork pie. Right? So, as I said, we started at Wetherspoons in Leeds. Not really a promising start, I sipped at my pleasant enough – but far too cold – pint of Thwaite’s Liberation, shivering in the cold station, still tasting toothpaste and waiting for my companions. Sure enough, Gareth, Alan and Simon headed to the bar came back with their pints (a pint of Moorhouse for Alan, being a Burnley man, a Leeds Brewery Winterspark for Gareth – which he was impressed with, go Leeds! – and something I forget for Simon) and all agreed that it was served too cold. A bit of whining about Spoons commenced, before we made a dash for our first train of the day – to Dewsbury. Sure enough, the first train was delayed (quelle surprise), but we refused to let this dampen our spirits. We whipped out our mobiles, found the website for our first proper pub, the West Riding Refreshment Rooms, and digitally slavered over their beer selection. When, some 10 minutes late, we got to Dewsbury, we found a real treat instore. The West Riding Refreshment Rooms are, essentially, an old waiting room turned into a pub, and it’s great. Made up of three small rooms, one is taken over by a small bar serving up far more real ale than they should be able to fit, with 8 pumps on a bar than can barely be 6 foot long. The atmosphere is thriving and bubbling, as the pub’s crammed full of Huddersfield Town fans watching Liverpool draw with Man City before heading to the Galpharm to watch Town defeat Hereford (obviously I didn’t predict the results; this is all written with the benefit of hindsight). We find a quiet (ish) corner and delve into our pints. Simon and I decide it would be rude not to try Anglo-Dutch‘s Kletswater, since it’s brewed in Dewsbury. It turns out to be quite a surprise package, a light, zesty, slightly caramely session beer with starts off exciting, gets quite boring by half way down the glass, but delivers well in the final third. A sneaky blighter indeed. I had intended to try and detail what my companions drank, but for some reason my memory is a little hazy… With such a choice on display though, we commented with surprise that many of the football fans were indulging in pints of Carling. We chose not to challenge anyone on this though. We finished our pints in Dewsbury ahead of schedule, so the next plan was to hit Huddersfield and visit between one and three pubs. 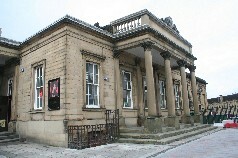 The Huddersfield boozing started at the King’s Head on the station. It’s an odd old pub. Clearly, no-one’s bothered to change the furniture, or indeed, clean it, for a good decade or so. We noted that it’s one of the few places in the world where you can go for a piss and be hit by a stench as you leave the gents, instead of when you enter it. 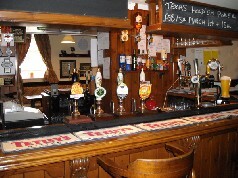 That aside, the beer selection is, as one would expect from a pub on the Real Ale Trail, splendid. I’m a sucker for anything local, and since they were selling a beer from Bob’s Brewery, the titular Bob having lived next door to me for much of my youth, it seemed only right that I went for a pint of his Healey Ale, a good, refreshing pale ale. Perfect for a long session like today. We had to drink most of our pints outside, so as to escape the smell inside, meaning we were soon off to pub number two, The Head of Steam. After settling down with a mint of Empire‘s Moonraker Mild – this pint proved a triumph, and can probably lay claim to being the best of the day – fruity, malty and rich – we were assured we’d have time for a round of beef sarnies and chips and still get our next train. They lied. We finished our sarnies and watched our train speed off. We were stuck in Huddersfield for half an hour, what to do? First, we got another beer in (a great treacly stout, called Treason, from local brewery Summer Wine for me), then we had to make a plan. (As an aside, it was while we were in the Head of Steam that we wondered why more stations don’t have platform-side pubs. I’d use the train much more if every journey could coincide with a good pint, and it makes waiting for trains a thousand times better). The answer was easy. 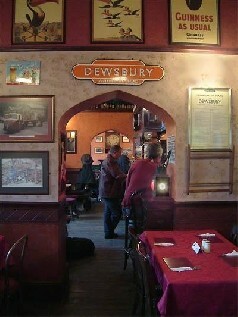 Dewsbury’s pub had recommended making a call to The Sportsman, just a few minutes from the station. So, with half an hour to kill, we made our way. I picked up a half of Newky Black from great Wakey brewery, Fernandes, and enjoyed a 6% killer of a rich stout. We then rushed (literally in Gareth’s case, who earned 7p by winning a bet that he could be first to the station) back to the platform and jumped on a train to Slaithwaite. Now, here’s where the claims of the Real Ale Trail get a bit murky. They reckon The Swan in Slaithwaite is 2 minutes walk from the station. They don’t mention that it’s actually over 5 minutes walk, or that it involves several big hills. We were lucky to bump into a bloke carrying several bottles of Brewdog beers (a sign of someone who knows their booze) who assured us we were on the right track, and sure enough, there it was, just over the next hill. The Swan was a proper locals pub. Loads of good beer, sport on a big telly, and a crowd that was mure than just real ale enthusiasts but folks from Slaithwaite enjoying a decent tipple. My drink of choice here was the ever reliable Saltaire‘s Copper Ale. It’s malty, slightly spicy and a little fruity. Splendid. Soon enough, it was time to head on to what would be my last spot (my Lancastrian companions would all make two more stops on their way home; I felt I was drunk enough to not go too much further). So, we hit Greenfield and The Railway Inn. This pub was, as the name suggests, built to house weary travellers straight off the train, and we were ready for some refreshment. As well as selling loads of beer, they also do splendid pork pies, with a range of mustards (although Simon wasn’t particularly impressed with any of the mustards, claiming they needed more spice. As a non-mustard eater I couldn’t contribute to this conversation). We all got a pint of Elland Brewery‘s Beyond The Pale – a floral, multi-award winning pale, why it wins awards is clear – while seated inconviently right infront of the big screen, blocking the view of the regulars who were there for Manchester United v Everton. We followed that with a very swift half of Millstone‘s Tiger Rut, another classy pale ale with strong citrus notes, and then it was time to seperate. With a slightly spinning head, I got my train to Huddersfield, nodding off and awaking just in time to leave the train, before making my way back to Leeds. I did try to read some of Pete Brown’s Three Sheets To The Wind on the journey, but my concentration couldn’t quite keep up with it. It’s worth noting here, that aside from a £4.80 ticket from Greenfield to Slaithwaite, I did this whole journey (including a bus at the start and end to Meanwood and back) for a mere £6.20 with a Metro Day Rover Bus & Train. I’d recommend it. It’s also worth putting in that I’m currently feeling the effects of the drinking documented just above, so I apologise for any errors that may appear. And for the increasingly scant details as the day went on. It was a long one, but a good one, and I’d like to thank the Bowland Stags for inviting me along. More on the Real Ale Trail here. 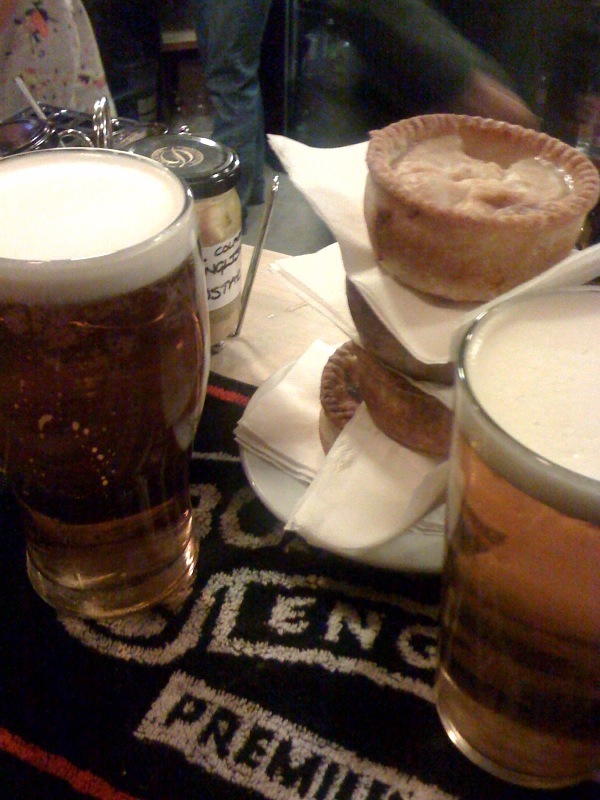 All photos (except the fuzzy one of beer and pork pies, which is mine) are nicked from their website too. One of the many good things about writing a beer blog, is that people who know and love (or like) you will often see an interesting beer while out on their travels and bring it back to you to try. My parents did that very thing on a recent trip into North Yorkshire. As they were on their way home from Richmond, they called me to say that they’re picked up four bottles of beer from the Richmond Brewing Company. Two for me, and two for my brother. Next time I saw them, I collected the bottles, and sure enough, they looked interesting. 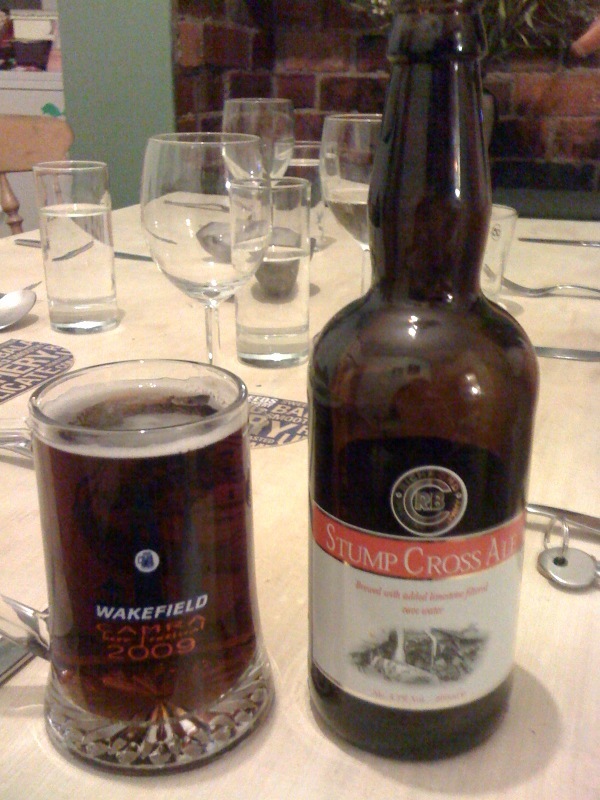 One was called Stump Cross Ale (named after Stump Cross in Pateley Bridge, obviously) and promised to be “a rich full flavour English bitter” brewed with limestone filtered cave water and the other was Richmond Station Ale, “a golden coloured, fruity crisp ale” named after the historic Richmond Station in which the brewery is based. Alas, these beers did not live up to my hopes. Presumably neither are bottle conditioned (at least neither claim to be so anywhere upon them), and while I don’t believe this is the be all and end all, as CAMRA might, it can often lead to a blander, less exciting beer, and that was the case here. Both were far from diabolical, but neither seemed to pack any punch, both tasting decidedly similar and strangely watery. 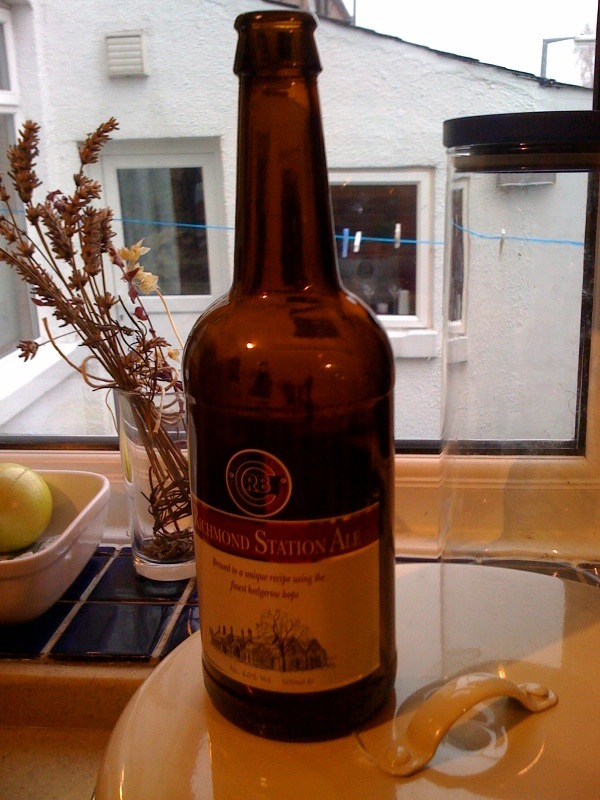 While the Station Ale did have a nice malty taste lurking somewhere in there, it tasted more like the kind of beer you’d expect a massive brewing corporation to churn out that the work of a small, independent brewery. A damn shame, but there are plenty more beers in the sea. It’s become a habit of mine to wander over to the beer isle in every supermarket I visit. Why? Well because as much as I love going to wonderful little beer shops and great independent bars, it’s a sad fact of life that supermarkets are really, really cheap. Yes, they may not give the supplier a good deal, and yes, they are responsible for small independent traders struggling. But sometimes I just can’t afford to pay full whack for quality beer, so I have to swallow that feeling of guilt and go ahead and buy. 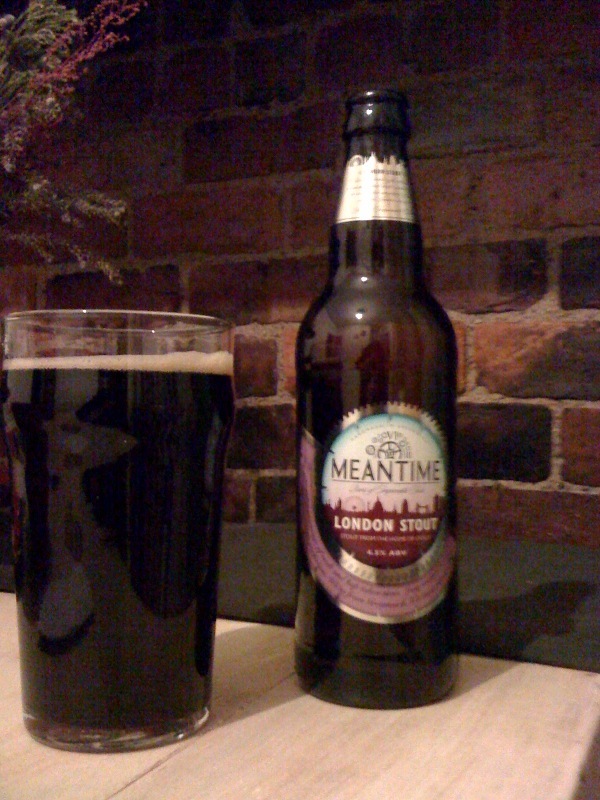 I’m telling you this, because on a recent visit to Sainsbury’s, I chanced across a deal on 750ml bottles on Meantime IP and Meantime London Porter. Two for £7. A bargain. So I bought them. The back of the bottle of IPA said “enjoy with hot food and spicy friends, or vice versa”, so as my girlfriend and I got making a lovely butternut squash curry, it seemed like the perfect opportunity to break out the IPA. So I did. A quick not on IPAs. If you buy, say, Green King IPA, or Deuchars, as nice as they can be, they’re not real traditional IPAs. Real IPAs were strong (this one clocks in at a respectable 7.5%) and full of hops. Why? Well because these India Pale Ales were, as the name suggests, going to India. The strong alcohol content and oodles of hops meant it had more chance of staying preserved on the long journey to our colonialist countrymen. Now, most IPAs are drunk in England, so there is no need for all the extra stuff, but good brewers (and Meantime is a good brewer, they won the 2008 British Guild of Beer Writers Brewer of the year, so it’s official) still make proper IPAs because they’re just really, really good and that. This one’s a treat. It smells of cloves, cardamon and banana, it pours a deep golden, almost copper colour. Like any beer worth its salt though, the taste is the real joy. The hops hit you full in the face, but not too strong, more like a sobering slap than a knockout punch (if you want a knockout punch try Brewdog’s Punk IPA). The uncompromising hops are bitter, dry and refreshing – what you’d want in India, I guess – and underneath, those spicy, fruity flavours linger on, a treat after the initial attack. And then the finish is smooth and oakey. You could almost believe it has spent the last few months in a barrel in the middle of the ocean. And as for that butternut squash curry, that was a delight too, and the dry hops and spicy cardamon flavours worked a treat with it. I’ll be doing that again. 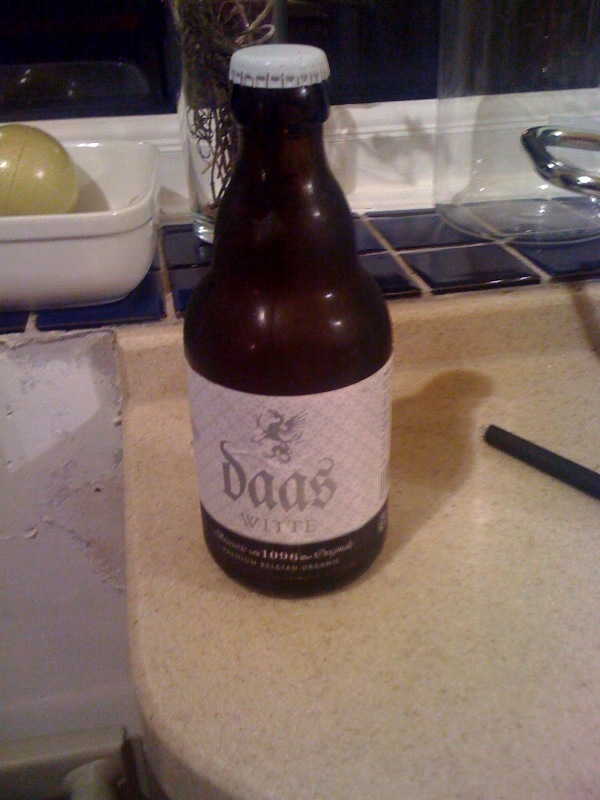 Following on from a previous post on the lovely Daas Blond, it’s time now to attack its sister beer, the Witte (read white, if you’re English and your skills of guessing translations are really poor). First things first, I’m not as impressed with this, the wheat beer, as I was with their strong blond Belgian ale. But, that’s not to say that I’m not a fan of this. Indeed, this certainly holds up well against many other Belgian wheat beers (I’m looking at you Hoegaarden). But wheat beers have always been a fvaourite of mine. I first got into tasting half decent beers when I discovered Hoegaarden (although my comment just two sentences ago tells you that I’ve since lost the taste for that beer) and later Erdinger at North became a staple. On hot day, I’m still liable to plump for a nice Erdinger over a traditional British ale – mainly just because it comes more chilled but tastes loads better than pretty much any lager. It’s worth also chucking in her that the Erdinger Dunkel (the dark one) is also pretty good, arguably better than the white one, and much better in those Autumn months. It pours a glorious pale colour, and isn’t half as cloudy as you might expect from a wheat beer. 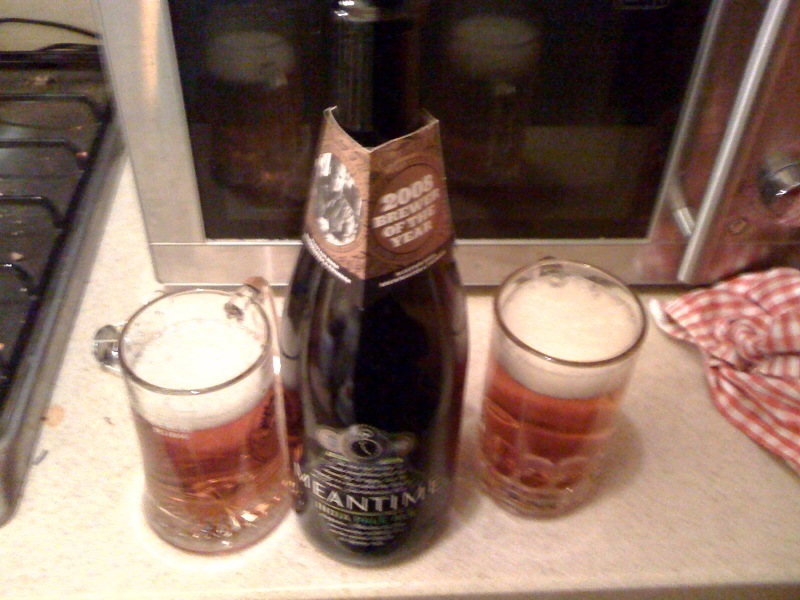 It’s taste, similarly is fresher and simpler than a lot of comparable beers. It doesn’t have that cloying sweetness you can find in some wheat beers, and those lovely citrus flavours come through really well – most notably the orange, which lasts long into the finish. Without wanting to get all technical on you (as if I could), this is a really good summer drink. It’s crisp, it’s easy and it’s refreshing and the sweetness comes from a gentle vanilla note that floats across with each sip, giving it a slight creaminess, some how (despite the thin head). Stick on top of that all that lovely stuff about it being organic (we all love that stuff these days) and you’ve got yourself a rather good beer. But, I’m definitely more likely to plump for a Blond over a Witte next time. I’ll save this one for the summer. Given that everyone’s all about organic produce these days, it’s a bit odd that there aren’t more organic beers out there. Yes, there are a few – Schneider’s Edelweiss, for one and Shepherd Neame’s Whinstable Bay for two – but the organic market is fairly under-represented in the beer world. Daas, though, have a couple of lovely Belgian ales that boast organic hops and barley in there list of ingredients and, more importantly, taste, yes “reet good”. I’m drinking their Blond right now, and it’s a fine example of a strong Belgian blond (think Duvel or Delrium). It’s the kind of strong (6.5%) beer that could easily win over a less adventurous drinker. The nose is all honey and spice – sweet and warming, and the glass is inviting, gold, glistening and with a rich, long-lasting foam. It’s even better to drink (as these things should be). That honey comes through warm and soft on the throat, with hints of the mellower citrus fruits, and maybe even a bit of apple kicking around too. But where Daas Blond is clever is that none of these flavours overpower that bitter hoppy finish, and the treacley aftertaste is gloriously sweet. For a beer best served chilled, it’s very warming actually (we’ll put that down to the alcohol content), and the sweetness never gets as cloying as some of those sweeter Belgian ales sometime can. And, of course, we’ve not really got into the benefits of these beers being organic. Because they are. And they’re not just shouting about being organic because they have nothing better to shout about. Nope, these organic hops and barley make a really splendid beer, and a great example of why the Belgians are, still, so highly regarded for their beer. They just do it so well.